Researchers at Albert Einstein College of Medicine of Yeshiva University have shown that soccer players who frequently head the ball have brain abnormalities resembling those found in patients with concussion(mild traumatic brain injury). The study, which used advanced imaging techniques and cognitive tests that assessed memory, published online in the journal Radiology. "We studied soccer players because soccer is the world's most popular sport," said Michael L. Lipton, M.D., Ph.D., associate director of Einstein's Gruss Magnetic Resonance Research Center and medical director of MRI services at Montefiore, the University Hospital and academic medical center for Einstein. "Soccer is widely played by people of all ages and there is concern that heading the ball - a key component of the sport - might damage the brain." Dr. Lipton is also associate professor of radiology, and of psychiatry and behavioral sciences, in the Dominick P. Purpura Department of Neuroscience at Einstein. On average, soccer players head the ball six to 12 times during games, where balls can travel at speeds of more than 50 miles per hour. During practice drills, players commonly head the ball 30 or more times. The impact from a single heading is unlikely to cause traumatic brain damage such as laceration of nerve fibers. But scientists have worried that cumulative damage from heading's repeated subconcussive impacts might be clinically significant. "Repetitive heading could set off a cascade of responses that leads to degeneration of brain cells over time," noted Dr. Lipton. To study possible brain injury from heading, the researchers used diffusion tensor imaging (DTI), an advanced MRI-based imaging technique, on 37 amateur adult soccer players (median age 31 years) who had all played the sport since childhood. Participants reported playing soccer for an average of 22 years and had played an average of 10 months over the previous year. Researchers ranked the players based on heading frequency and then compared the DTI brain images of the most frequent headers with those of the remaining players. All participants also underwent cognitive testing. DTI "sees" the movement of water molecules within and along axons, the nerve fibers that constitute the brain's white matter. This imaging technique allows researchers to measure the uniformity of water movement (called fractional anisotropy, or FA) throughout the brain. Abnormally low FA within white matter indicates axon damage and has previously been associated with cognitive impairment in patients with traumatic brain injury. "The DTI findings pertaining to the most frequent headers in our study showed white-matter abnormalities similar to what we've seen in patients with concussion," said Dr. Lipton. "Soccer players who headed the ball above a threshold between 885 to 1,550 times a year had significantly lower FA in three areas of the temporal-occipital white matter." Dr. Lipton noted that players with more than 1,800 headings per year were also more likely to demonstrate poorer memory scores compared to participants with fewer yearly headings. "Our study provides compelling preliminary evidence that brain changes resembling mild traumatic brain injury are associated with frequently heading a soccer ball over many years," said Dr. Lipton. "While further research is clearly needed, our findings suggest that controlling the amount of heading that people do may help prevent brain injury that frequent heading appears to cause." Not to argue against the study but I did coach youth soccer (Boys and Girls K-8)for about 15 years and have been a long time fan. Just some comments: While soccer balls may travel up to speeds of 50 miles an hour, generally that would not be the occasion when a player would be looking to head a ball. When a player properly heads a ball it is usually done by striking the ball more toward the hairline than the top of a head. That makes it easier to see and direct the ball. I don't know where the statistics are taken from but 12 headers a game seems extraordinary. Regardless, if a player is that aggressive, it would tell me that he or she would be likely to have a lot of incidental, head to head contact. That would be a lot more damaging than hitting the ball. 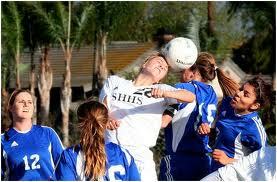 Is there any control in this testing that would factor in head injury from something other than the ball? I am just mentioning this for anyone who might be worried about having kids play soccer. It is a very healthy game and does build team play more than any other in my experience. All that aside, if, in fact, this test shows brain damage from merely heading a soccer ball, can you imagine the damage from having your head bashed by a charging football helmet or having it smashed to the artificial turf by someone who has been taught that injuring an opponent is a goal?